Apple has released iOS 10 beta 5 download for developers. The update came as a surprise for everyone. Apple dropped the traditional iOS beta release cycle, and rolled out iOS 10 beta 5 download to developers this morning. The update comes a week after the release of iOS 10 beta 4. Apple’s iOS 10 beta 5 download is available for developers. You can install iOS 10 beta 5 using both direct iOS 10 IPSW download links and OTA update. The iOS 10 beta 5 download is available on both sides. Registered iOS developers can use direct download links, while others can download iOS 10 beta 5 using OTA update. We are installing iOS 10 beta 5 on our devices for further testing and making a sheet of the changes that Apple made in this beta. Sudden release of iOS 10 beta 5 to developers confirm some side rumors we discussed before. The iOS 10 beta is finally entering the wrap up situation at Cupertino, and Apple is fine-tuning it with iOS 10 beta 5 released to developers. 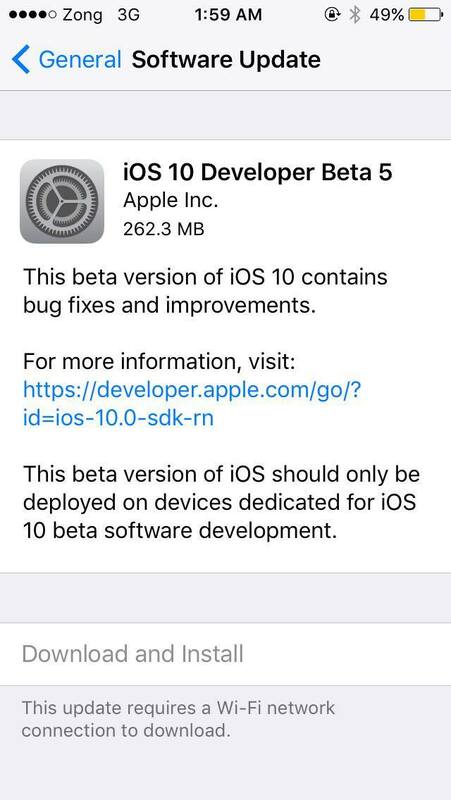 Initially it was rumored iOS 10 Gold Master build may come out for developers, but Apple launched iOS 10 beta 5 to developers today, just a week after the release of iOS 10 beta 4 to developers. Apple has confirmed the iPhone 7 launch event must be happening in the mid of September. The earlier rumors were based on the iOS 10 beta development, and everyone was expected to see how Apple reacts with rumors. The Cupertino company has made things clear with release of iOS 10 beta 5 download to developers. The iOS 10 development is almost at end and soon it will be ready for public launch. The next-generation iPhone 7 will be running iOS 10, and Apple is expected to announce iOS 10 final version at the launch event for iPhone and iPad devices. The beta 5 update confirms about the wrapping up of development and more focusing on making it less buggy and more performance targeted iOS update for general users. You can download iOS 10 beta 5 using the OTA update. In order to get iOS 10 beta 5 update on your iPhone, you need to install iOS 10 mobile provisioning profile which will enable you to receive iOS 10 beta 5 download update on your iPhone and iPad devices.